This community woodland spans 4.5km of tracks, with four wood woodland paths and more than 30,000 trees and shrubs. 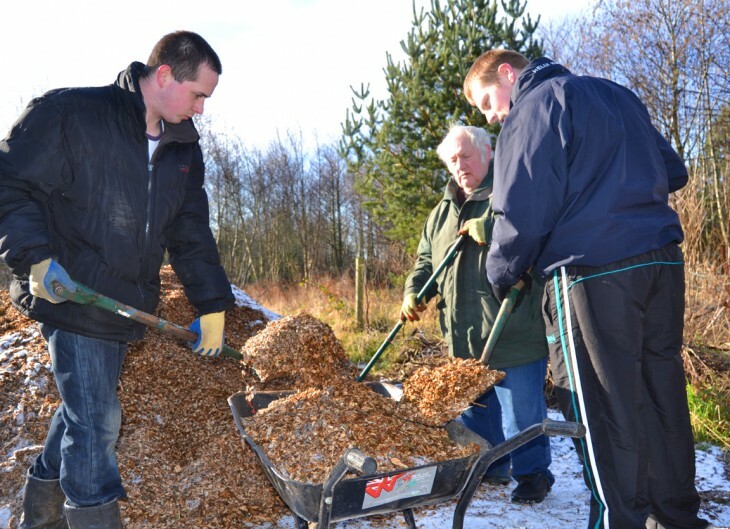 Formerly a cokeworks, Monkton Community Woodland provides a number of vital links between communities and a wonderful network of green spaces and wildlife, as well as providing opportunities for volunteering and health activities. Monkton Community Woodland landmark The Swarm. The northern section of the woodland forms part of the Great North Forest and the former Bowes railway line, which runs through the site, is now part of the Sustrans long distance cycleway linking to other green space both east and west of the site. The boundary to the site features two award winning sculptures ‘The Swarm’ and ‘The Hive’. 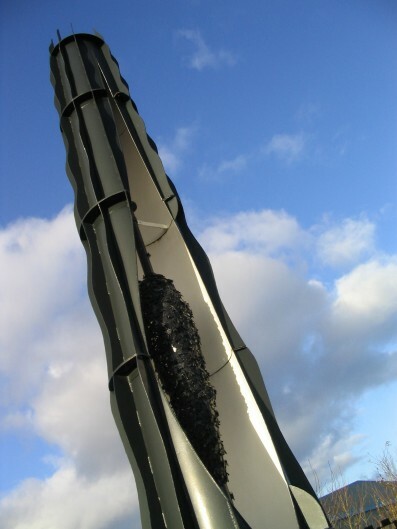 The innovative pieces of art were produced by local artist William Pym and represent the transformation of Monkton Coke Works from a polluted industrial site in to a natural green environment. The site of the woodland was originally agricultural land until the development of the site to accommodate the former Monkton Cokeworks. 1936/37: The Cokeworks was built by John Bowes Partners Ltd as the Government’s response to the Jarrow March of 1932 in which Jarrow residents marched to London demanding jobs. 1947: The works became nationalised and came under the control of the National Coal Board (NCB). 1953/56: Major expansion of the works and new coking ovens were installed. 1964: Output of carbonised coal had reached 285,000 tons and the site had a capacity of stocking 250,000 tons of coke. 1979: Another major renewal / expansion – 33 additional ovens resulted in the works doubling production – along with the pollution. 1987: The Hebburn Residents Action Group (HRAG), led by local County Councillor and resident Cllr Jennie Shearan was formed in response to a proposed further development, which would result in increased pollution and detrimental effects on the health of local residents. Parts of the surrounding housing estate had become known as “death row” and there is anecdotal evidence that “every house had an oxygen bottle in it”, due to the respiratory illnesses caused by the toxic pollutants from the site. 1990: After a three year battle, the HRAG received news that not only was the proposed development to be abandoned, but also that the plant was to be closed. 1992/93: The plant was demolished. 1998: The site was acquired by One North East. 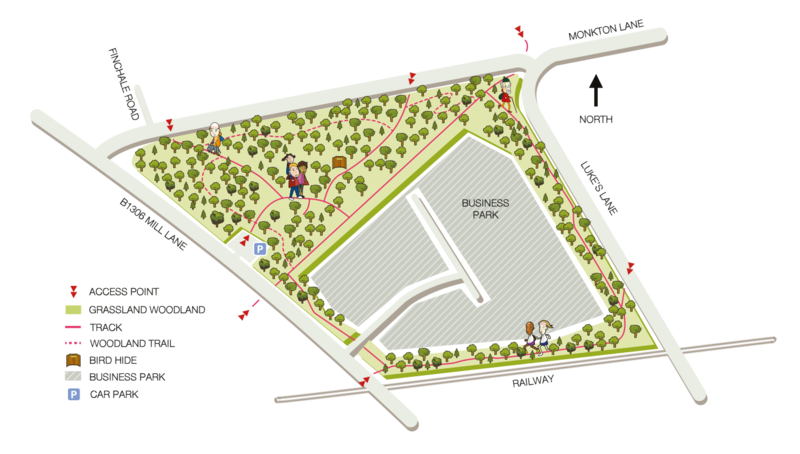 Half of the site, (approx 10Ha), was to become a business park, with the remaining 10ha being designated as public open space and was planted with trees as part of the Great North Forest project. 2005: The site was transferred to The Land Trust and management of the woodland area became the responsibility of Groundwork South Tyneside and Newcastle. The woodland is on part of the former Monkton Coking Works so has a history of contamination. The site was restored by One North East using money from the Homes and Communities Agency’s National Coalfield Programme. The Coalfield Progamme also provided the endowment which allows the Trust and its managing agent to manage the environmental liabilities and provide the added value activities. The site provides key links that allow people to walk or ride between communities and access a wider network of open space. Site maintenance is undertaken by a social enterprise and a regular programme of health improvement activities is held on site. The space demonstrates that when actively managed, small space can make a big difference.